"I'm done; I'm going back to Monson and never coming back out here again." to cross flooded Big Wilson "Stream"
The AT guide and map warns hikers about the large streams in this area northeast of Monson, part of a 15-mile section running from Hwy. 15 to Long Pond Stream. I planned to do 14.3 miles of it today, where Jim was reasonably sure he could get road access to the AT from the north. We were also fore-warned by Diana and Regis Shivers. 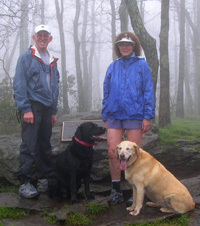 Regis ran the AT in 2003. Diana wrote: "He about drowned crossing Little Wilson & Big Wilson Rivers....had lots & lots of rain and made them swift and deeper. Swept him right under...very scary!!" The elevation of this section is very low. The highest I would get is about 1,400 feet on Big Wilson Cliffs. The Trail was beautiful, traversing a series of low slate ridges, some ledges with views, huge mossy boulders, and deep valleys and gorges, all with streams. 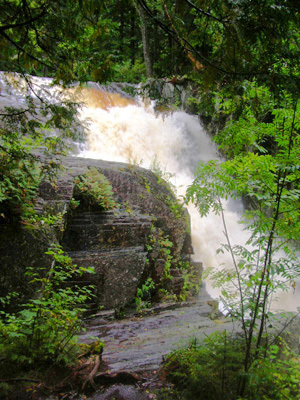 There were ponds, swamps, bogs, and spectacular waterfalls. There were also innumerable "streams" to cross, especially after several inches (apparently) of rain fell last night and this morning. We could hear the hard rain all night but barely found any weather reports on TV or radio this morning since it was Saturday and about all that's on is cartoons. 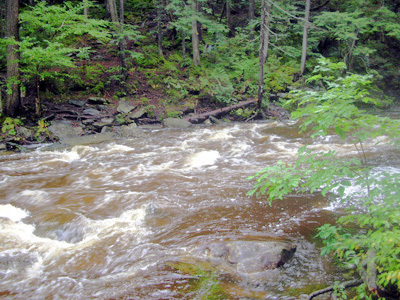 The guide warns about dangerous crossings of the larger streams if the water is high. It was a watery, green world. And today it was a very dangerous place to be. The hikers who holed up in Monson or in shelters were the smart ones. When the alarm went off at 6:00 AM, I told Jim I wasn't going out on the Trail today because of all the rain. I could hear it during the night even though I wore ear plugs. He understood; we'd already discussed the creeks and rivers on the course. We slept three more hours, then prepared to leave the campground for one in Greenville, near Moosehead Lake. On the drive to Greenville we passed the AT parking lot on Hwy. 15 about 11 AM. Who should we spot but "Steady Eddie" in "Charlie Brown's" little blue crew car, heading out to get Charlie back at Moxie Pond. By then the rain had nearly stopped. I already felt like a weenie for taking another "rain day." I thought of the rivers and creeks that Ed had just traversed, and made a snap decision to get on the Trail today, despite the late hour. It was the worst decision I've made the whole AT Run! Jim pulled over at the next spot that would hold the camper. I changed into running clothes and got my gear and he took me back to the trail head. Since it was "only" fourteen miles and there was plenty of water (HA!) for Cody, I took him with me. Then Jim headed back north to Greenville to set up the camper, find the little roads to the rendezvous point, and come in 4.4 miles on the Trail at the end to Big Wilson Stream to meet us. That was clear almost immediately. The Trail was one big creek and puddle with all the run-off. Of course it occurred to me that the creeks would be higher than normal, but I assumed it would take more time for the water to get down to them from the Barren-Chairback Mountain Range. Although Big Wilson might be a problem, the AT guide indicated there was a "high water route" one could take by following the river downstream for 1.5 miles to a road, crossing on a bridge, and going back upstream another 1.5 miles on the other side of the river. I assumed there was a clear trail to follow. I assumed entirely too much today! In fact, I should have turned around within the first mile when I saw how much water was pouring down the Trail. I tried to call Jim to tell him to come back and get me after unhooking the camper, but I had no signal. So I kept going. Cody had a blast in all the water, racing back and forth in the puddles and run-off. I felt good and was optimistic that I could negotiate the creeks with patience and the two trekking poles I carried. 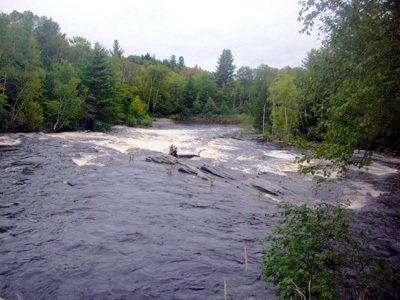 The two branches of the Piscataquis River weren't bad yesterday after a rainstorm. How bad could these streams be? Pretty bad, I was to soon discover. The first nasty little crossing was only three miles in, right below the Leeman Brook lean-to. Cody and I had already successfully negotiated the swollen outlet streams of a couple ponds, but Leeman Brook was a narrow chute full of knee deep water moving very, very fast. Cody got across OK and I was able to hold onto a fallen tree and large rock for balance. It unnerved me a bit, though. 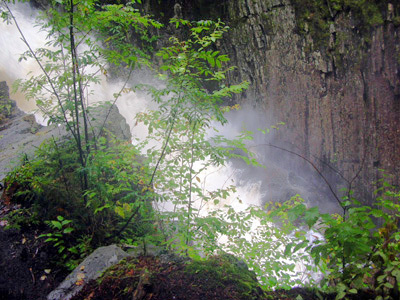 We got up the steep, rocky bank on the other side and walked up to the lean-to, soaked. Inside were three hikers, reading: "The Honeymooners" and "Chainsaw." Jim met Chainsaw at the Caratunk Post Office recently but this was the first I've met him. All three intended to hole up at the shelter for at least today; they were sufficiently convinced after hiking in three miles this morning from Monson that it would be fool-hardy to continue. I consulted The Honeymooners' map (Jim had ours) and tried to call Jim. No signal. I knew by then he was probably on his way to the rendezvous point. If I didn't get to the Big Wilson, how would he know I'd turned around? He wouldn't know where I was and would be sick with worry. Cody and I continued on. We passed more beautiful ponds and mossy rock outcroppings and trudged through more watery trail, averaging more than thirty minutes per mile, slower than my estimate. I knew Jim would worry when I was "late" at Big Wilson but I just couldn't go any faster on the rough trail. About 2:15 PM I started hearing the roar of Little Wilson Falls, a spectacular waterfall that runs through deep charcoal-colored slate walls. This is the highest waterfall on the entire AT and it was full of rainwater. I was terrified, knowing the "stream" crossing was only 2/10ths of a mile downstream. It was a raging torrent up here; how could it be calm enough to cross down below? It wasn't, of course. I was a nervous wreck, pacing up and down the area near the crossing, trying to determine where the safest place would be to ford the "stream." (Which looked like a river to me, as wide as it was - at least 40 feet, if not more.) I couldn't see the rocks on the bottom nor determine the depth. I wasn't aware of any other trails on my side of the river. I wasn't looking for any because none was mentioned in the AT guide or map. Ah, what's that? A rope? Some kind soul had strung up a rope from trees on either side of the river. It was nearly in the water on my side, but up high on the far side. I waded in to test it. It seemed securely tied on my side, and pretty taut. I wasn't sure if it would stay above water in the middle with my full weight on it but I eventually got the courage to try. What a leap of faith! I spent about fifteen minutes making my decision to cross the river and probably less than five actually getting across. I ordered Cody to stay, which he did, and plunged in. The water was knee-deep at first. I was holding onto the rope with my left hand and held the trekking poles with my right hand, using them for balance against the very strong current. I was smart enough to know to be on the downstream side of the rope. I inched my way across, having to dodge a very large, smooth boulder that hikers probably cross on top when the water is at normal depth. The current got progressively stronger and it became harder and harder to keep my balance. About half-way across, just after I decided to hold onto the rope with both hands (still holding my poles in the right one! ), I lost my footing because the current was too strong. By this time, the water was chest-deep. I was hanging from the rope, face down. Fortunately, the rope stayed above water! I would have been in deep, deep trouble if it hadn't. I inched my way across with my hands now, instead of my feet, until I was about knee-deep in water about ten feet from the far shore. Ah, I could let go of the rope and stand now. I got on shore and looked for Cody. Thank goodness he was still sitting where I told him to. He barked as if he was saying, "OK, Mom, it's my turn!" I called him to me. Cody is compact and strong, all muscle and bone. He is a powerful swimmer. If I had any doubts about his ability to make it across that river, I never would have crossed myself. Although he was carried by the current about fifty feet downstream, he did a magnificent job swimming to the far side. He ran to me and excitedly shook the water off, thoroughly enjoying his adventure. I was shaking, too, not from the excitement or being cold, but from sheer joy that I was still alive and hadn't been carried off downstream. I stood there for about five minutes, looking at the swirling torrents of water, seeing another falls upstream (not as big as the first one), taking photos of the river. I still can't believe I did that. It's got to rank up there with the five scariest things I've ever done in fifty-six years! Then my thoughts turned to the Big Wilson. This was the Little Wilson. How much worse could it get?? But I knew that there was a "high water route" ahead, so I continued on. The next three miles were so beautiful. We climbed over lots of slate outcroppings on the Big Wilson Cliffs and got high enough for a phone signal. But Jim's mailbox was full and I couldn't leave a message. Finally, he called me and we were able to talk. He was able to drive to the AT crossing near Long Pond Stream all right (although he dinged up one of the truck steps on a ditch running across the road). He walked in about fifteen minutes and met his first obstacle: a raging creek (Vaughn Stream) that is forded right above a twenty-foot waterfall. He could tell it would be dangerous to cross on the Trail; if he slipped, he'd go right over the falls. Another hiker, "Bigfoot," was coming toward him, going north. The two of them scouted for a safer place to cross upstream. Jim decided to stay put while Bigfoot crossed safely. They walked back to Jim's truck together, talking about the Trail conditions. Bigfoot (who is well over six feet tall) had successfully crossed the Little Wilson, Thompson Brook, and the Big Wilson, but he was spent. Each was progressively worse, he reported. That's when Jim called me, to see if I was OK and determine my location. At that time (about 3:00 PM) I was about two miles from the Big Wilson. Hearing about Big Wilson, I told Jim I was going to take that "high water route" south to the road and bridge on the map. Jim agreed to go about forty miles around to meet me there. 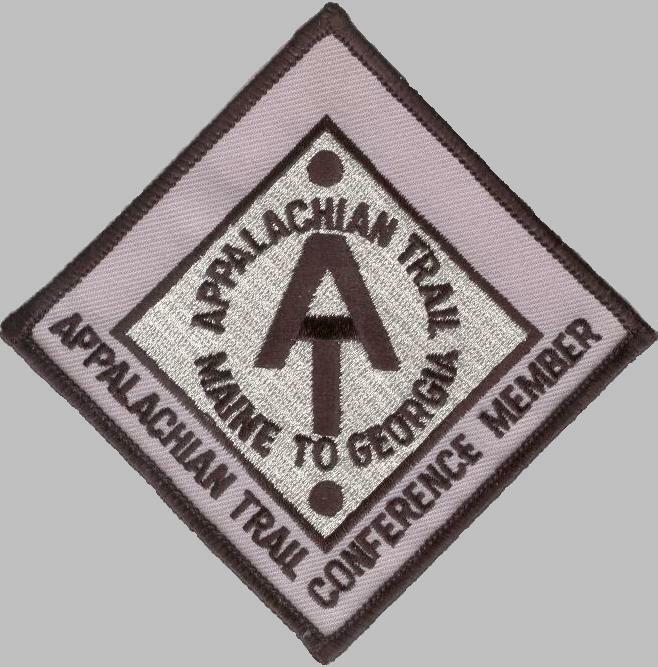 The road is impassable for about a mile at the AT crossing so he couldn't just drive three or four miles to that point. Nothing is easy in the Hundred-Mile Wilderness. 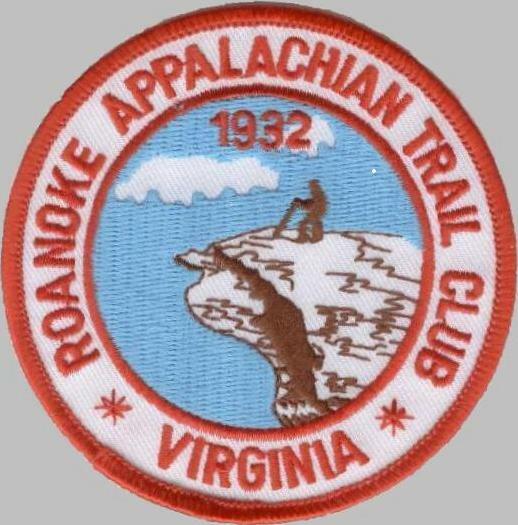 A mile later I met a drenched "Kokomo," the thru-hiker about my age that I mentioned yesterday. He was on his way back south on the AT. He was a wreck. Twice he tried to cross the Big Wilson, and the second time he went under the water. He lost his poles and nearly lost his life, he said. He watched as "Santa" and "Bigfoot" got across but he gave up trying after being swept under. He's lucky he didn't lose his glasses -- or his life. Kokomo also tried finding the "high water route" and turned back, but I didn't fully understand why until several days later. I'm glad I didn't talk with him further about it at that point because I probably wouldn't have gone that way, and I'm not sure what would have happened then. Kokomo was concerned about contacting "Stumblefoot," the woman who's crewing for Bigfoot and him. His cell phone was damaged in the water and mine didn't have a signal. (I put my phone and camera in separate zippered sandwich bags and they survived several dunkings today.) He planned to return the nine miles to Hwy. 15 and get to Monson. I don't think he could have gotten there before dark. Kokomo was so upset, he said he isn't going any further on the AT. He refuses to step foot on the Trail again. Wow, I thought. That must be some flooded river up ahead! He told me about another nasty stream crossing before I'd get to the Big Wilson. Oh, great. Well, at least I'd know when I got to the correct river. I came to a 90-degree left turn in the Trail and could see what I assumed to be Big Wilson "Stream." Oh, my. This wasn't the crossing but I could tell it wasn't going to be any less wide, deep, or swift half a mile upstream where the AT crosses it. This was no "stream," just like Maine's "ponds" aren't ponds. Mainers are the masters of under-statement. I was on a nice, smooth path now for the first time. It was formerly the Big Wilson Tote Road. I came to Thompson Stream where it dumped into the Big Wilson, and wasn't keen on crossing it if I didn't have to. Although it was only about twenty-five feet across, it was also raging and I couldn't tell how deep it was. I remembered seeing a double-track "road" at the 90-degree turn. It went the right direction and might be the "high water route," although it wasn't marked. I back-tracked a quarter mile to it and headed south along the river. What a mess! It was muddier and wetter than the AT had been. I followed it about ten minutes, came to multiple streams from the Big Wilson, and thought, "This can't be right. Maybe that's not the Big Wilson." I retraced my steps, crossed Thompson Stream (waist high, difficult), and came to the AT crossing of the Big Wilson. No way in creation was I going across that!!! At 4:30 PM on September 17, let it be known that the Big Wilson "Stream" was well over 100 feet wide, who knows how deep, and raging wildly. And there was no rope to cling to. No wonder Kokomo was traumatized! Now I was in a total quandary. My phone didn't work. I didn't know if Jim was able to get to our new rendezvous point. I didn't know if I could follow the river downstream because there was no trail discernable in all the water on the tote road, which seemed to peter out where I'd stopped earlier and turned around. It would be dark if I went back to Hwy. 15, Jim wouldn't know where I was, and I sure didn't want to cross the Little Wilson again. At moments like this, you have to decide something. I used my best judgment, headed south on the tote road again, and hoped it would be less than a mile now. Two hours later I reached the road, bridge, and our truck. It was a grim walk. The tote road was mostly under water. I was knee-deep in many puddles and had to cross several more streams near their emptying point at the river. At one point I was on a decent path and could see footprints. There were a couple of slick, rotted log crossings over water that Cody and I negotiated carefully, then the trail ended. Then I came to another river about 70-75 feet across, very close to its merger with the Big WIlson. Again, I couldn't tell how deep it was. The current looked less strong than the Little Wilson (certainly much less wild than the Big Wilson). I scouted upstream a ways but didn't see any better place to cross. There were lots of railroad ties on the other side, as if someone was intending to build a bridge here sometime. Or maybe it had washed out; there were two concrete pilings under water that I could detect because of the way the water flowed around them. Cody plunged on in and was across before me. This time I took off his collar, which I should have done crossing the Little Wilson the first time. He could have gotten it snagged on a tree limb and drowned. I say the "first time" because my hunch was correct: this was the Little Wilson again, about to become one with the Big Wilson! Thank goodness the current wasn't as strong here and there were fewer large rocks. There was no rope. The water was up to my ribs (I'm tall, 5'9") on the far side. I was close enough to the far side when the current was the strongest that I felt I could just swim to it if I lost my footing. I didn't really have to swim but I lunged the last six feet to the bank as I lost my grip on the river bottom. Whew! I was relieved to get across yet another flooded "stream" safely. Soon after this I came to a better dirt road. I turned left and found myself very close to the Big Wilson. Suddenly Cody went off on a short trail toward the river, wagging his tail excitedly like he does when he is tracking either Jim or me. That gave me hope, although I realized he could be tracking a moose or bear instead of Jim! He did it again at a little tent site. Then I saw a car. That made me so happy, knowing I was getting close to a real road. I was even happier to see the bridge and our truck! Unfortunately, Jim wasn't in it. I got into some warm, dry clothes, wrote him a note, grabbed my light and phone, and took off with Cody. Where could Jim have gone to find me? Turns out Jim stayed on the decent dirt logging road that went back to some tent sites. He took a right on the short, muddy logging road full of puddles that ended at the Little Wilson (where I had just crossed it in the second location) and he thought it was the Big Wilson. He returned to the better road and went north on it, paralleling the Little Wilson for at least a mile until he saw the double AT blazes at the place I first crossed that river on the rope. He didn't see the rope or he might have known he was following the wrong river since I had mentioned when we talked that I'd crossed the Little Wilson on a rope. And I didn't see the trail he used when I crossed there. I don't think I would have taken it anyway. It wasn't on our map and I would have had no idea where it went. Although it was rough it was significantly better than the route I bushwhacked along the Big Wilson. Jim thought he was at the Big Wilson crossing. He figured I should have come to that point by now, but waited until after six for me. When he finally left he placed one pole, half a food bar, and a Hammergel flask on the trail to show me the way to go. I reached the truck at 6:08, an hour before dark. I returned at 7:00, unable to find Jim on the road he took. I was so afraid he would have to cross the Little Wilson nearby in the dark, which would have been super dangerous. He didn't even have trekking poles (I didn't know about the ones he borrowed.). I sat in the truck with the heat on and my phone plugged in, recharging it. There was a weak signal but all I got was Jim's voice mailbox (he'd emptied it out after I told him it was full). I was worried sick about him, hoping he'd soon return to the truck. I left a light on inside so he could see it down the road a bit and know I was back. We figured out pretty fast what happened (that he was following the Little Wilson upstream to the AT, not the Big Wilson), and confirmed our suspicion back at the camper when we consulted the AT map. Jim had the map on him when he was searching for me but didn't realize he was following the wrong river. We consider ourselves extremely fortunate. I'm a bit traumatized by my experience, but not so much that I won't get back out there again in a day or two and finish up the last 104 miles to Katahdin. I've come too far to give up the dream now. I just need to let the "streams" subside to their normal levels. I'm writing this on Sunday morning in the safety and warmth of our camper at the Moosehead Family Campground near Greenville. I woke up in a sweat several times during the night in the middle of vivid river-crossing nightmares. I finally got up after eight hours of sleep to work on this entry, hoping that writing about it will be therapeutic. I'm glad I had Cody with me. He did fine in all the creeks and rivers, clamored over the rock ledges better than me, and helped keep my mind off my woes. I had another life to save and that kept me more focused and calm. Jim and I are both sore today. 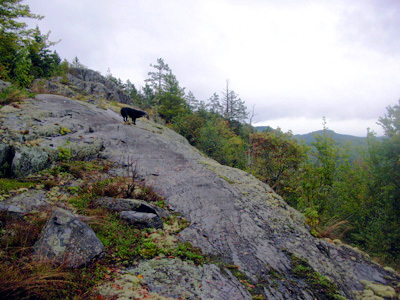 Even though he didn't go through any raging creeks or rivers, he had a tough hike up and down that rugged trail. My shoulders and arms are sore from the death grip I kept on my trekking poles going through the strong currents and from using the rope to cross the Little Wilson the first time. I can't believe I was able to hold on to it with my full weight and the weight of my pack (which was full of water by that point) with my arthritic hands - and I was holding the two poles in my right hand, too! I now know for sure that I am capable of doing things I never thought possible. I don't want to recreate this situation ever again, though.